Cypriots, angered by the terms of the EU bailout, will get to take money out of their banks again Thursday. Cyprus reopened its banks Thursday for the first time in nearly two weeks, after taking the unprecedented step of setting limits on the movement of cash out of the country to other eurozone states. For the first time since the euro was launched on Jan 1, 1999, a member country has restricted how much money individuals and companies can take across its borders. The tiny island nation put the extensive measures in place to prevent a run on its banks as they reopened around noon local time (6 a.m. ET) for the first time since March 16. 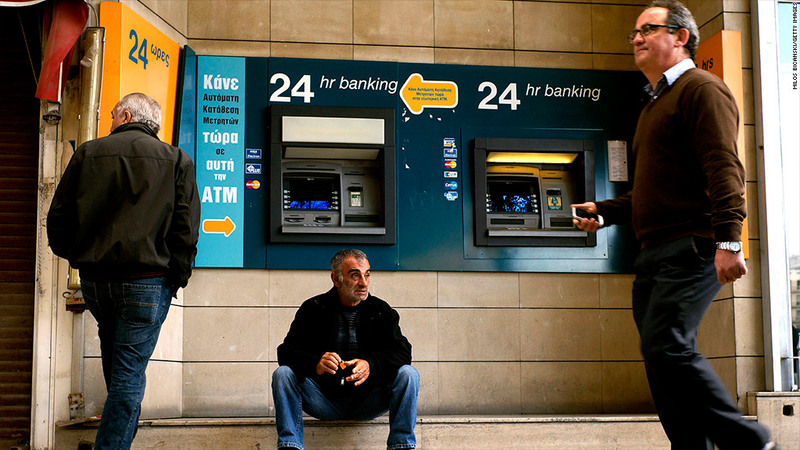 Cypriots have been queuing at cash machines since then as it became clear that deposits would be raided as part of a bailout by the European Union and International Monetary Fund. Security company G4S said it would provide over 150 extra security staff on Thursday at the request of the Cypriot banks to support additional cash deliveries. Cyprus was brought to the brink of financial collapse and possible exit from the eurozone by its two biggest banks -- Bank of Cyprus and Popular Bank -- which together lost 3.5 billion euros on Greek government debt, wiping out a third of their combined capital. It turned to its European Union partners for help and after months of negotiations signed up at dawn on Monday for a 10 billion euro rescue, equivalent to nearly 60% of GDP. In return, Cyprus committed to raise billions from big depositors to fund the winding down of Popular Bank and to recapitalize Bank of Cyprus. The EU wants Cyprus to shrink its bloated banking industry to average size by 2018, meaning shedding about half its assets. Many of those deposits belong to foreign investors, in particular Russians, and Cypriot policymakers are trying to prevent an uncontrolled flight of capital that could cause the economy to implode. Credit and debit card use abroad would be limited to 5,000 euros per month, and people leaving the country will be able to take only 3,000 euros in cash, the Cyprus state news agency reported. There will be a ban on the early withdrawal of funds on term deposits and on transfers of more than 5,000 euros abroad, unless approved for trade purposes on a daily basis. Checks will not be cashed but can be paid into accounts, and a daily cash withdrawal limit of 300 euros will be introduced. Getting this right is fraught with risk: Too loose, and a catastrophic loss of assets could follow; too restrictive, and business activity will be choked and confidence in other eurozone states with large foreign deposits could be shaken. Economists say the shrinking of the banking sector, one of Cyprus' main industries, will in any case plunge the country even deeper into recession and could mean another bailout as debt hits 140% of GDP. It is supposed to fall to about 100% by 2020, according to the bailout plan. Some deposits may have leaked out in the last two weeks through branches of Cypriot banks in Moscow and London. Cyprus has pledged to protect depositors with less than 100,000 euros, after its parliament rejected an earlier version of the bailout that would have tapped them too.